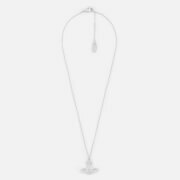 Women’s silver-tone pendant from Marc Jacobs. Crafted from silver-tone metal, the dainty necklace comprises a cable link chain that fastens with a lobster clasp and features the option of an adjustable size. 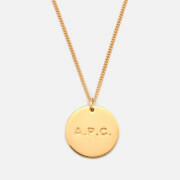 The pendant is complete with two engraved discs to each end and a black enamel disc charm embossed with Marc Jacobs branding.